Aaron Draplin, Von Glitschka, Damien Golden, Karen Larson, Debbie Millman, Crystal Reynolds, and Jamie Saunders recap day three of HOW Design Live in Atlanta with me. And the coloring book I discuss briefly with Karen? A page illustrated by Darcy Hinrichs (shown above), includes me as a spaceman! I didn’t realize being in a conference bag coloring book was on my bucket list until I saw it. So cool. Our 6th interview podcast from HOW Live (recorded in Boston), brings us Jim Krause – and the return of Dyana Valentine. Jim Krause has written many of the books you’ve seen in the profession of graphic design (color index books, the new logo brainstorm book, idea index, and more). Dyana needs no introduction on this show. This is very much a traditional Reflex Blue Show where we chat about a bit of everything: what Dyana is doing for Neenah Paper at the conference; Jim’s books; Darcy Hinrichs introducing their joint talk; their joint ’30 in 60′ talk (which I also blogged about for Against the Grain); movies; and more. Next week we’ll be back with an AIGA Nebraska event special. Following that? 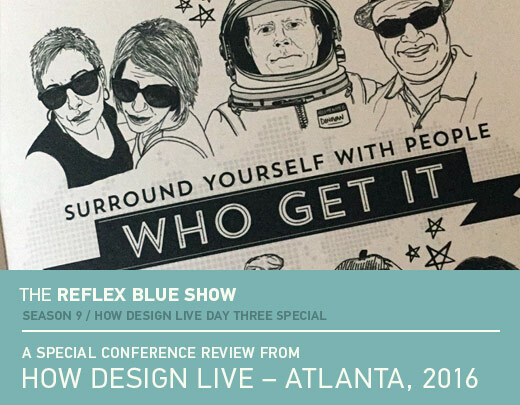 Hatch Design joins us for our final HOW Live, and season 5 finale – The Reflex Blue Show #100 (what?! We’ve done 100 of these? Really?). 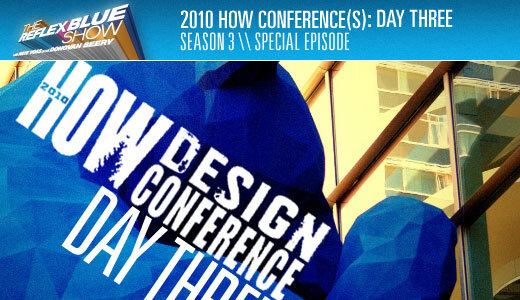 Monday – and the How Conference kicked into full gear. We bring in Steph Doyle and Darcy Hinrichs to recap the day with us. The day went by way to quickly, hoping today turns out just as exciting. Catch us with the day vis Twitter (@36point and @vossome), and we’ll be back tomorrow! Download The Reflex Blue Show, 2010 HOW Conference Special: DAY THREE or, click here to subscribe to The Reflex Blue Show from the iTunes Music Store.